Readers, we are starting week five of the midweek solo suppers… so far I’ve managed to share one online. Woops. I’ve been challenging myself to spend less than £30 a week on groceries – including breakfast, lunch and solo suppers. It’s not as easy as you’d think, when you are buying ingredients. I can understand why people on really limited budgets struggle to buy decent food. I shop at discounters, don’t really buy many branded items and watch what’s going into the trolley but it still mounts up every week. Especially if you are a meat eater! 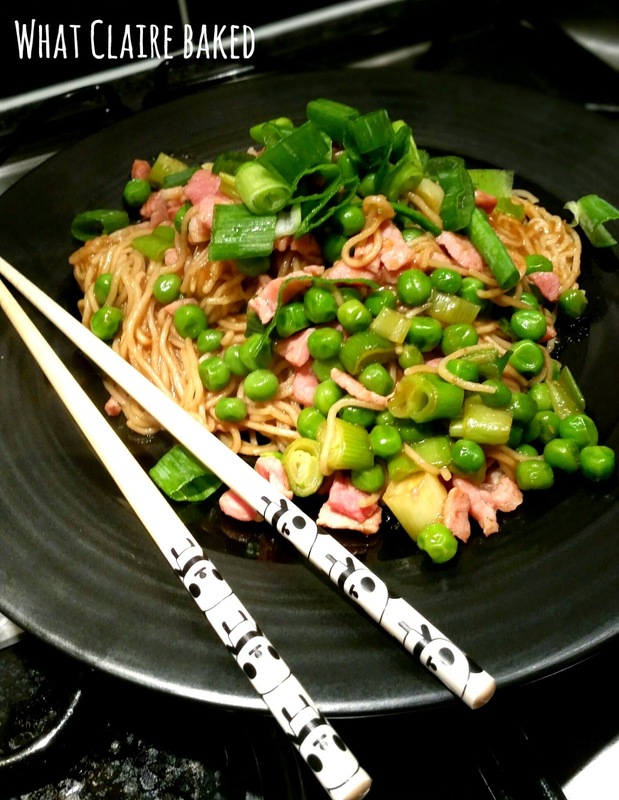 This entry to Solo Suppers is a simply healthy take on the pot noodle. It’s made with simple vegetables and one slice of bacon which can be taken from the freezer and defrosted before use. This great dish can also be pulled together in less than 20 minutes, perfect for nights when you are in a rush. The original recipe comes from BBC Good Food’s meals for one selection. 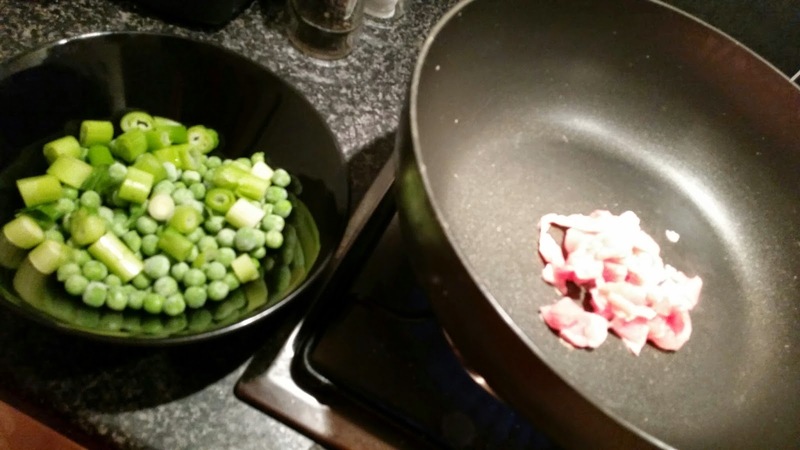 Cut up bacon and add to a medium pan (don’t worry about oil – the bacon fat will melt). Chop the spring onions and add to the pan along with the frozen peas. Cook for several minutes. Boil the noodles in separate pan for around 3 minutes. 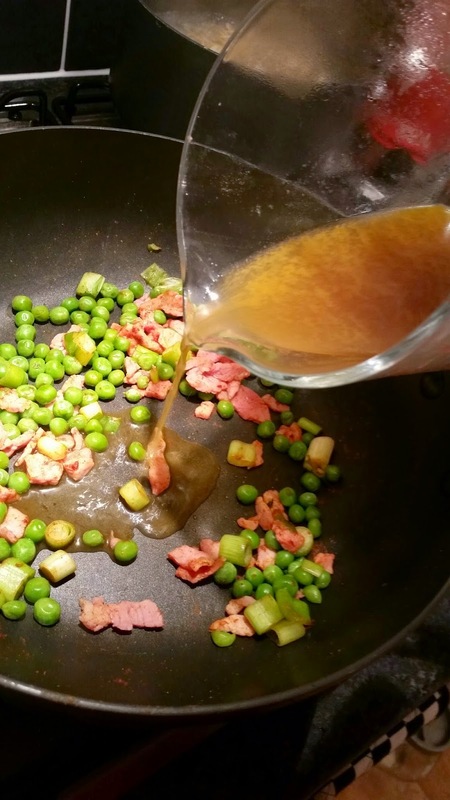 Add the vegetable stock to bacon and vegetables, mix and cook through for 1 minute. Add the cornflour paste and paprika to the pan, mix until a sauce is formed. Drain the noodles and add to the pan of bacon and vegetables, mix through the sauce.